Sunshine to the Square Inch: Thanksgiving - Kindy Style! We did rotational cooking classes. 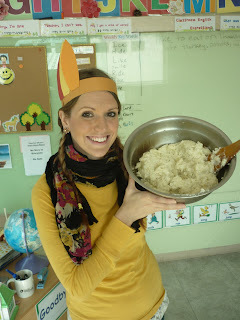 I, of course, chose to cook mashed potatoes as I cook them every year for Thanksgiving! 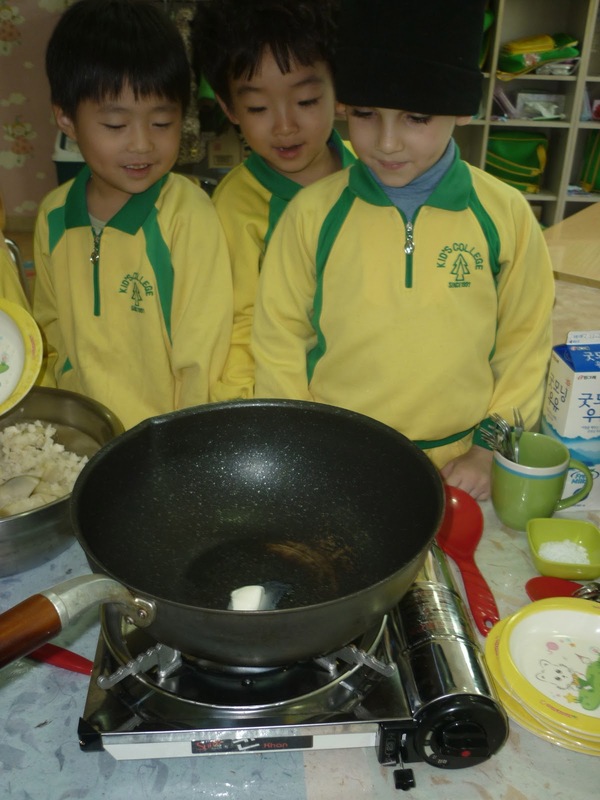 Korean's love their portable gas stoves and I must say it is great for cooking class! The kids love cooking! Safety isn't always first in Korea but somehow the kids manage to not burn themselves! and walaaaa! I LOVE LOVE LOVE mashed potatoes! Then we had a massive feast! 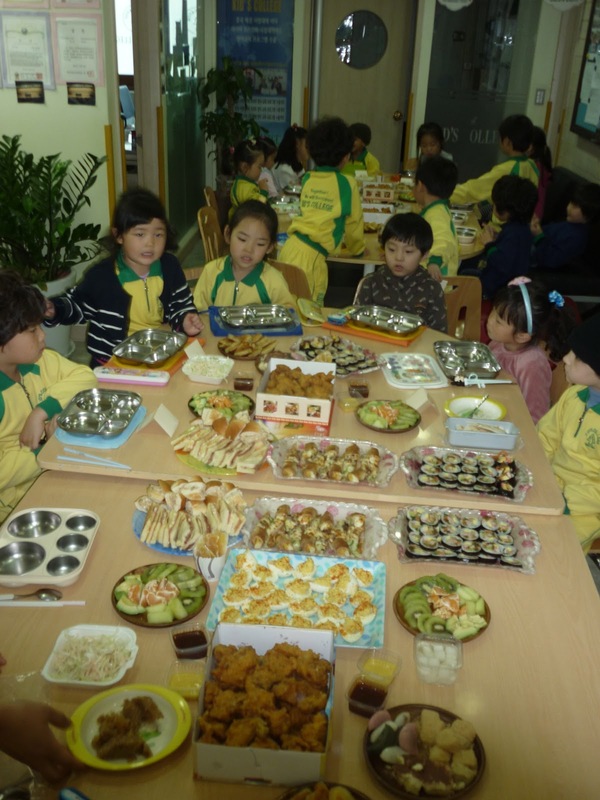 The food included: mashed potatoes, deviled eggs, caramel apples, gimbap, fruit, avocado (which is a rare thing here! 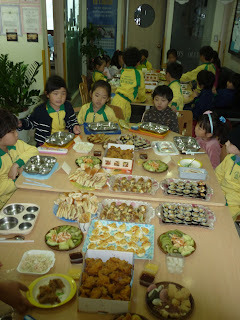 ), sweet potato cakes, fried chicken, songpyeon, cabbage salad, sandwiches and I can't remember the rest. There was no rice or kimchi served. After lunch we did a craft with our kids followed by Turkey Bowling! The kids had a great time and it was fun to see them have so much fun! Ethan, Alisha and I! I'm so thankful for these two co-workers! It was a long and tiring day but very awesome! I am not home this year but I am so thankful for where I am and for how God has blessed my life. I never in my life imagined spending a Thanksgiving Day surrounded by 20 kindergarteners but it was one of the best Thanksgiving Day's I will remember and I wouldn't have had it any other way. God, through these little kids, has blessed my life more than I can ever say or describe and for that I am thankful! To all my friends and family back home ... I love you each very much, am thankful for you and hope you have a HAPPY THANKSGIVING! Psalms 103:2 - Bless the LORD, O my soul, and forget not all his benefits. Ephesians 3:20 Now unto him that is able to do exceeding abundantly above all that we ask or think, according to the power that worketh in us, unto him be glory in the church by Christ Jesus throughougt all ages., world without end.